Over the last few days I’ve been working on a database started by my friend and glove expert, Angharad Thomas, recording details of extant and known antique Yorkshire Dales gloves. I’ve included ‘known’ because in their book ‘The Old Handknitters of the Dales’, Marie Hartley and Joan Ingilby described several pairs they had seen whose whereabouts are now unknown. In their book we have illustrations for two of these pairs, the S Hunter pair and the M Pearson pair, which I refer to as such because they have those names knitted into the nameband. So even without access to the actual gloves, or photos of them, we can tell a lot about their design from Marie’s illustrations. In fact we now only know the whereabouts of 2 the 8 pairs Hartley and Ingilby described. However, several other antique pairs of Yorkshire Dales gloves have come to light since they first published The Old Hanknitters of the Dales, so our database includes entries for 20 pairs. 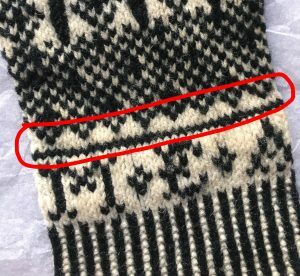 I cannot find this detail on any Sanquhar gloves, so it seems that this is another characteristic that differentiates Yorkshire Dales Gloves from Sanquhar gloves. 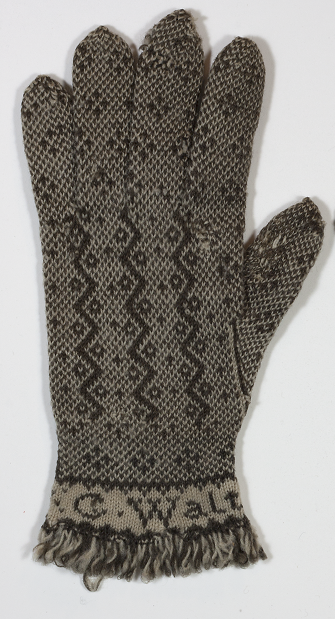 It even appears on the S Hunter gloves that were knitted in Swaledale circa 1850. The only Dales gloves it doesn’t appear on are the 1846 G Walton gloves. However, even on these there are peaks above the nameband. The only thing missing is the solid contrast colour round below them. Bizarrrely they do have a solid contrast colour round above the peaks! Alas, I don’t have my own photos of this pair, but you can find a photo at my friend Penelope Hemingway’s blog, here.